25 Reasons to Visit Morocco! 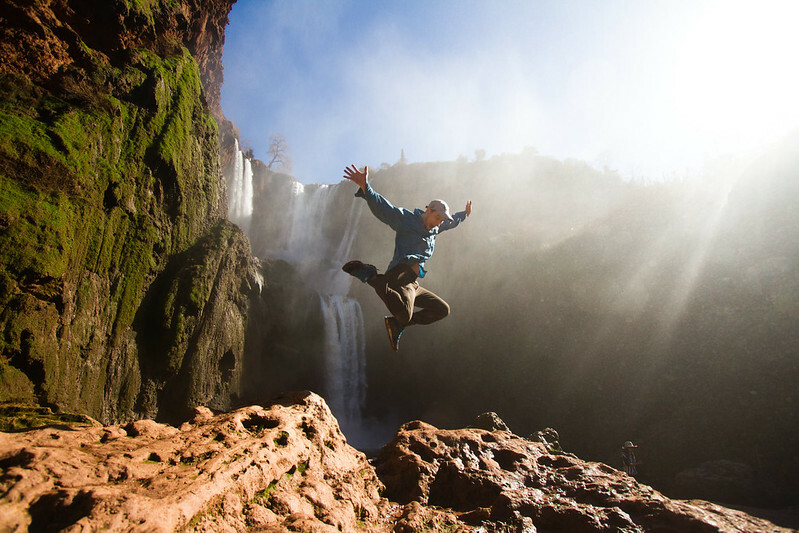 | 25 Reasons to Visit Morocco! Home Morocco 25 Reasons to Visit Morocco! 1. 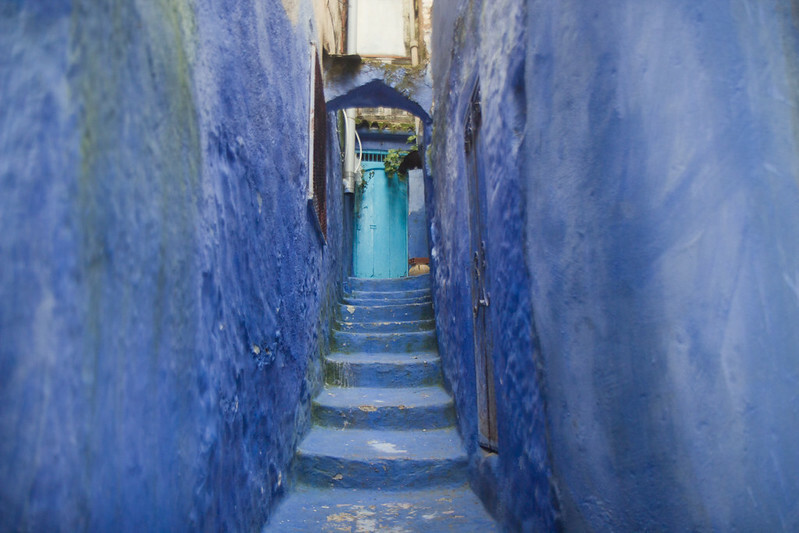 Chefchaouen, sometimes known as the ‘Blue Pearl’, was our first major Moroccan destination. Chefchaouen is a quiet and colourful town set against the Rif Mountains, in North-western Morocco. 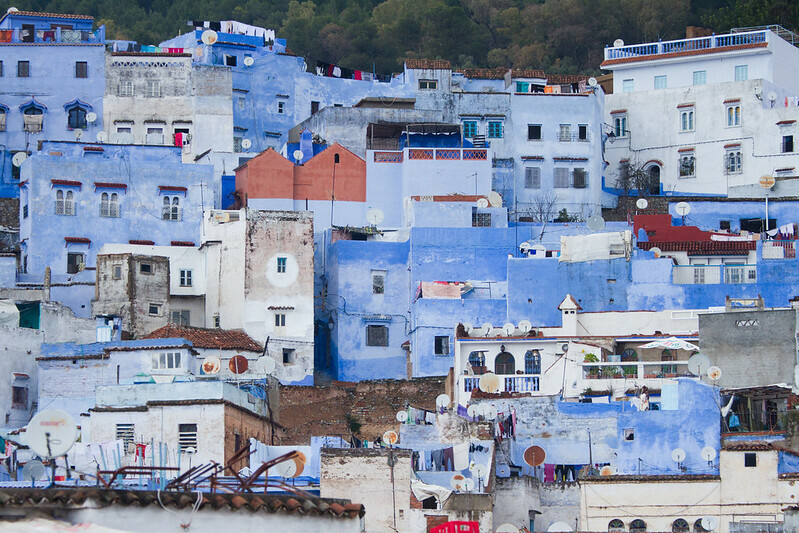 The town is famed for it’s distinctive blue rinsed buildings, and for it’s slightly more laid-back attitude/bohemian vibes, which makes it a perfect introduction to Morocco for the thousands of visitors the town sees yearly. 2. We spent a couple of days in Chefchaouen, staying at the Chefchaouen Campsite. We explored the ancient medina, a maze-like network of wandering winding paths, alleyways and market-stalls, guided by a local man (who was certain we’d need a guide and rather determined to follow us around!). If you visit the town, it’s very likely you’ll be offered numerous guided tours – all for a price, of course! 3. We drove south from Chefchaouen, hoping to make it all the way to Errachidia, a city sometimes known as the gateway to the sahara desert. We were ready to see the sun, after a number of days mist and rain. 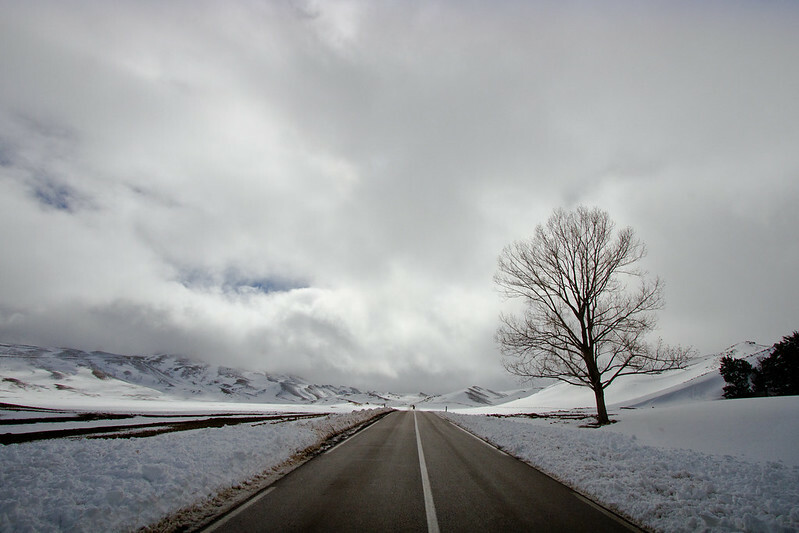 However, the mountains in Morocco in the winter, are no joke, and we found ourselves stranded in some number of mountain villages, waiting for snow-ploughs to open the roads ahead of us. We would wait for hours, behind queues of trucks laden precariously high with straw bales, cars over-flowing with people, shepherds herding their sheep, and once in a while we’d see some freezing looking tourists on motorbikes. 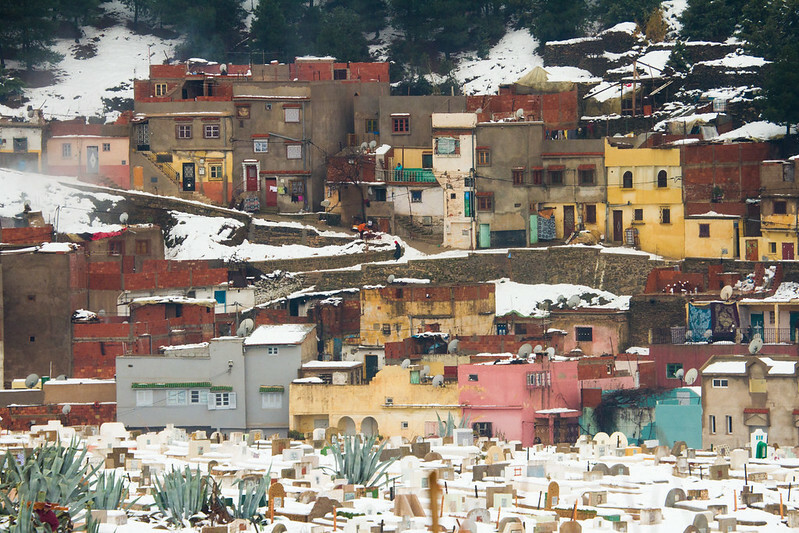 It was an interesting insight into the realities of life for the locals, in the Moroccan winter. We were thankful we had our van to keep us warm! 4. 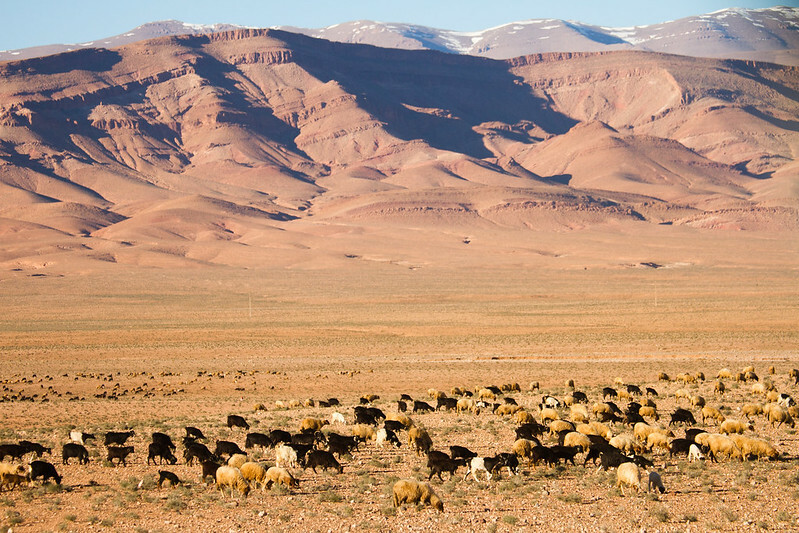 We were making our way to the desert, but first we’d have to cross the barren high mountain plateaus, covered in several metre high snow drifts, that separate the harshness of the Moroccan south from the milder climate, and greener, more hospitable, landscapes, of the Moroccan north. The views were dramatic, and every once in a while, we’d see tiny stone houses, smoke bellowing from their chimneys – a hard place to call home. The roads were a little perilous, too – we spotted some number of trucks flipped to their sides on the edges of roads. 5. Eventually, we emerged from the mountains. The landscape transformed almost immediately, it felt as if we’d driven out into an entirely different country or continent. The buildings were now built out of mud, there were no trees, and the snow had been replaced by red and orange sandy rock, scrub and wasteland. We were making our way, now, to Errachidia, a town sometimes referred to as ‘the gateway to the Sahara‘. 6. Driving south from Errachidia, the landscape became increasingly desolate. Eventually, though, the road started to follow a network of crumbling kasbahs, lush strips of date and palm oases, scattered sparingly with villages entirely crafted out of mud. 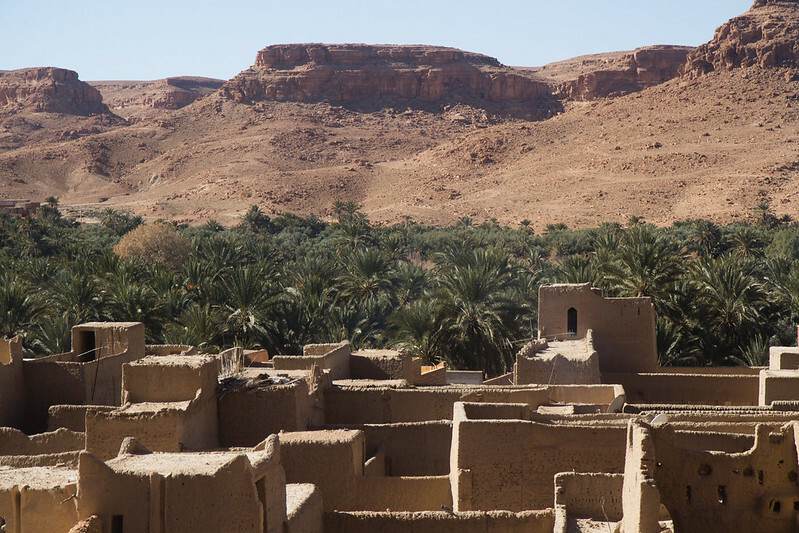 These villages are what remains of the old caravan routes of years gone by, former wealthy trade routes that would reach from Marrakech out across the Sahara to Timbuktu, carrying salt, gold, spices, and slaves. After a series of droughts, and the closure of the Algerian border in 1994, these ancient trade routes have become obsolete – however, there is still a small trade in rose water, dates, and henna. After driving through barren landscapes for days, it felt almost miraculous to see these deep green palm trees rise out of desert gorges. 7. The main reason for our excursion out into the very edge of the sahara, though, was the tiny village of Merzouga. 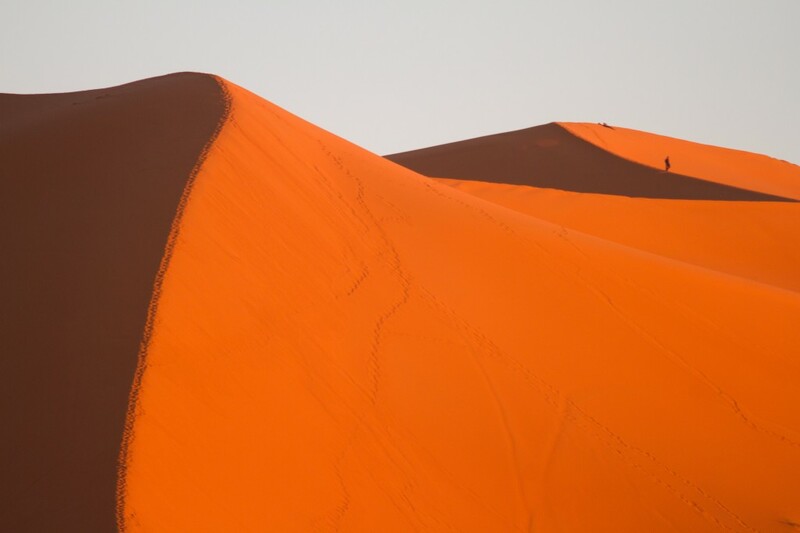 Merzouga is found 35 miles south of the Algerian border, and is well-known for it’s close proximity to Erg Chebbi, a 50km long and 5km wide series of sand dunes reaching up to 350 metres high. We stayed a few days in Merzouga, one night spent enjoying berber hospitality at Kasbah Mohayut, and a couple of nights at a local RV park. 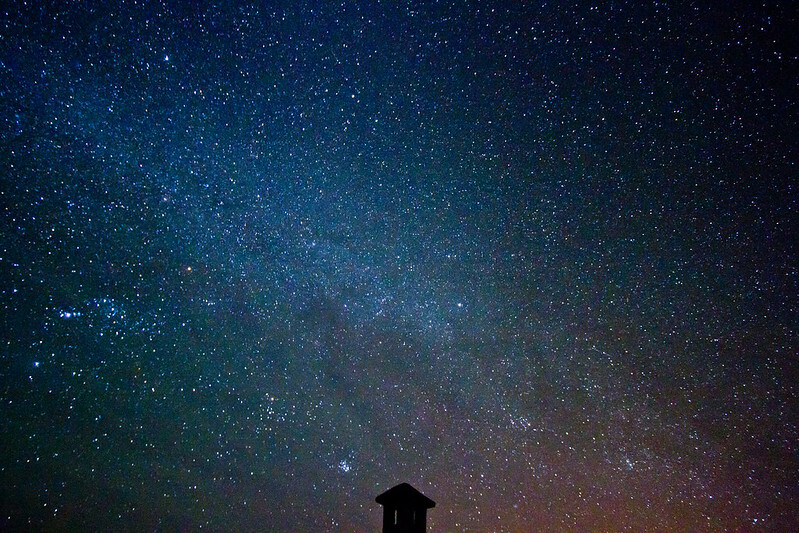 Whilst in Merzouga, we discovered that Saharan night skies really are some of the most magnificent in the world! 8. 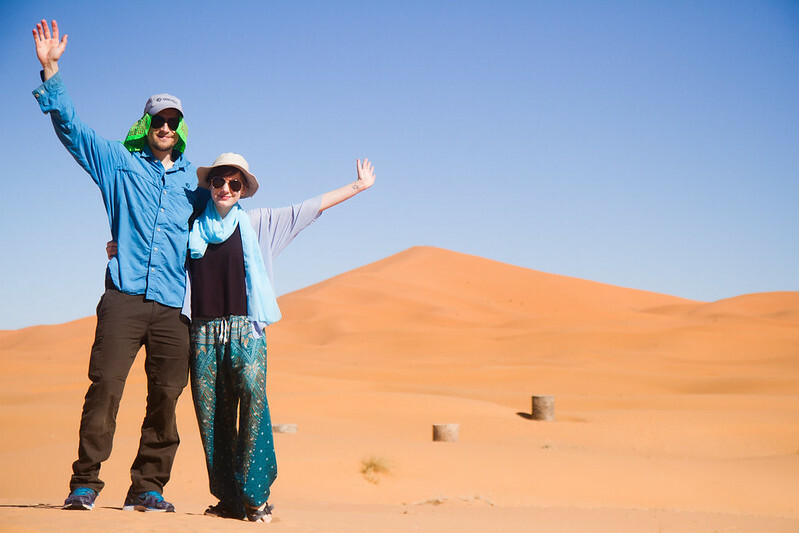 Most people who make the journey out to Merzouga do so to spend a peaceful night out on the sand dunes, camping in Nomad style tents, or perhaps to ride a camel. 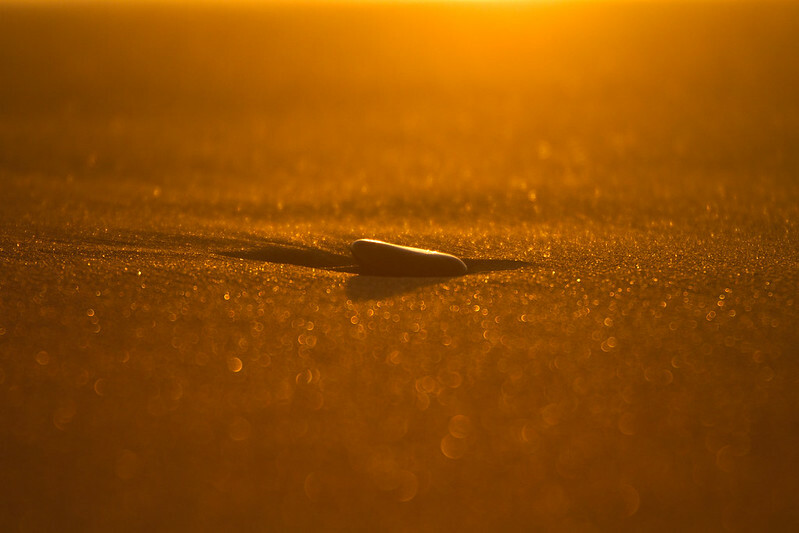 For us, sunset over the dunes was immensely beautiful, the pristine sky deep blue against saffron-coloured waves of sand. 9. From Merzouga, we continued our journey north-west, as there was no further south to travel. 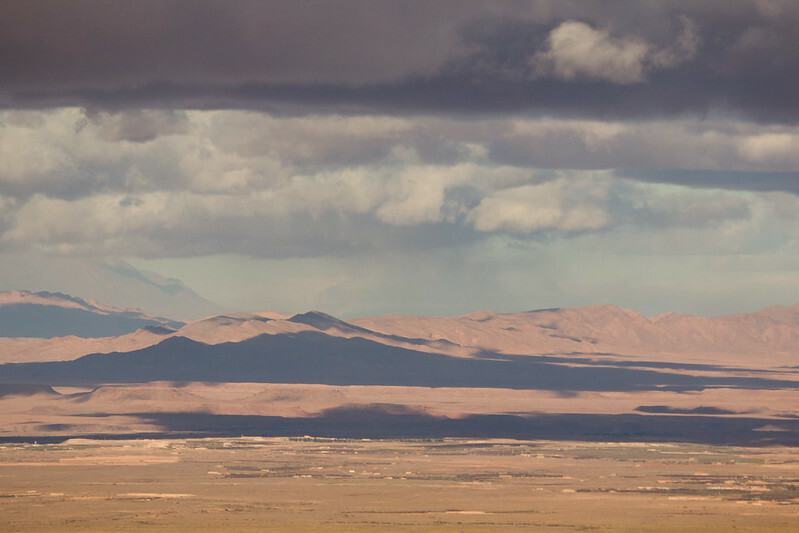 The landscape continued to be harsh and desolate, and for the most-part, uninhabited and lifeless. Every now and then, we’d see a shepherd herding some sheep, or a collection of camels roaming around. We were heading now to Route 307, a shortcut we’d heard of that cut through the Atlas Mountains. 11. 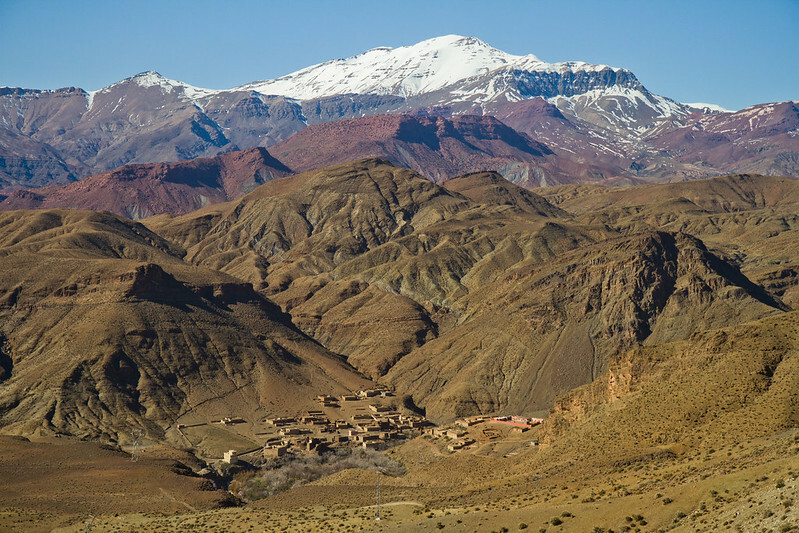 Tiny villages, reachable only by donkey, high up in the Atlas Mountains. 12. 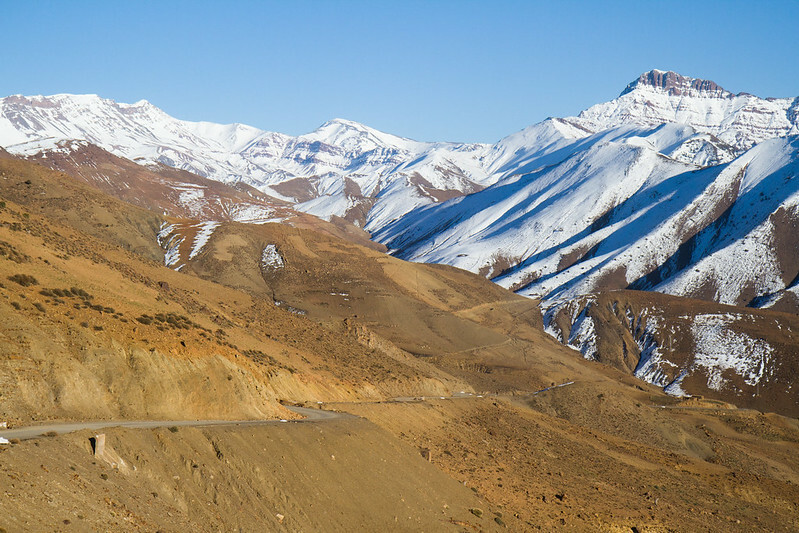 Challenging roads and breathtaking snow-capped peaks! 13. The air at the top of Route 307 was biting, and the scenery was truly jaw-dropping. 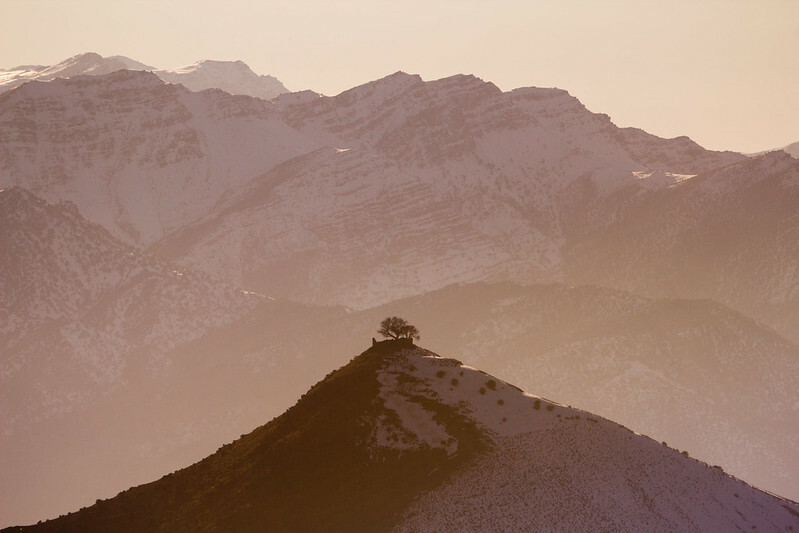 The setting sun transformed the mountains into deep pink and pale peach, as we tried to make our way down to somewhere a little more comfortable to spend the night. 14. We’d crossed Route 307 with the idea of directly making our way to the town of Demnate. 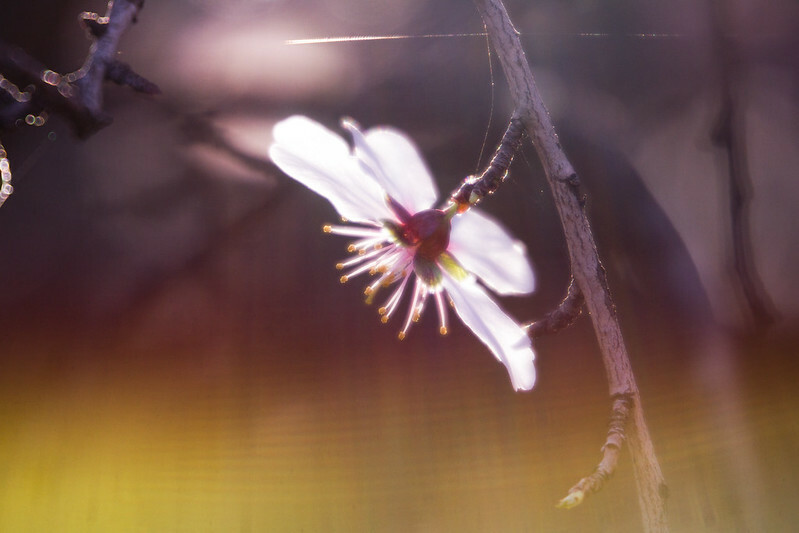 Eventually, once again, the landscape transformed, as we descended from the mountains, and we were now surrounded by rolling meadows, and blossoming almond trees. 15. Near Demnate are the Cascades D’Ouzoud; a fairytale-like series of cascading waterfalls and gushing pools, surrounded by olive groves, pomegranate trees, little restaurants, market stalls, and dense forests home to Barbary Apes. 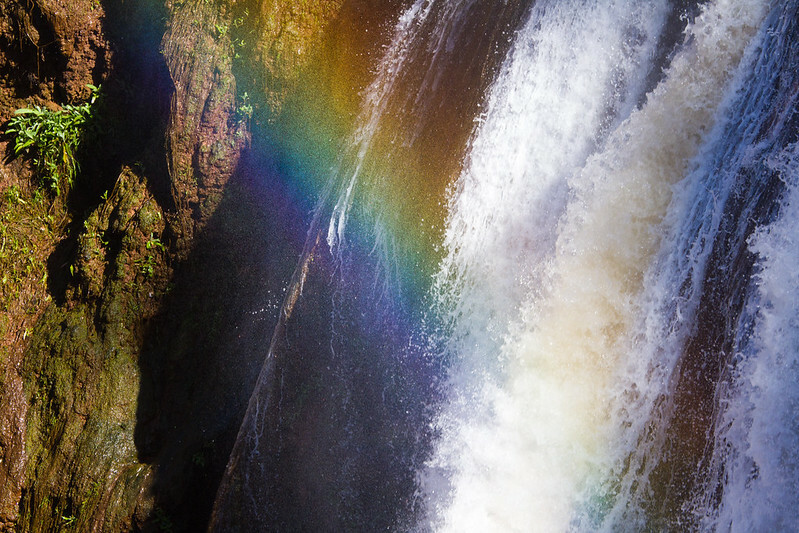 The Cascades are a typical vision of Moroccan Paradise, and photographs of the falls, complete with typically vivid rainbows, can be found up and down the country on postcards. We loved the cascades, they were refreshing, alive with the sounds of birds, and rushing water, and a wonderful contrast to the desert landscapes of previous days. 16. Blossoming almond trees lined the roads as we drove east from Cascades D’Ouzoud. Farm stalls selling Almonds, Honey, Rose-water, oranges, bananas, and Argan Oil, often manned by young children, were commonly spotted as we made our way around Morocco. 17. 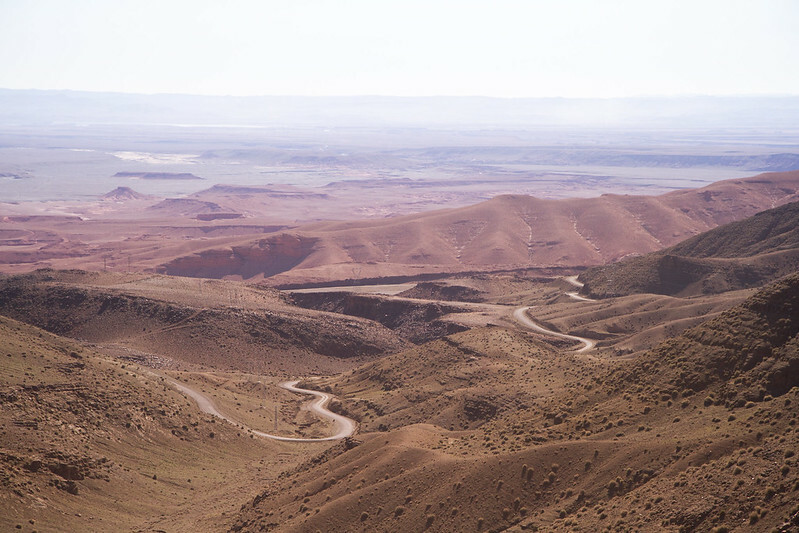 The huge variety of Morocco’s landscapes surprised us. 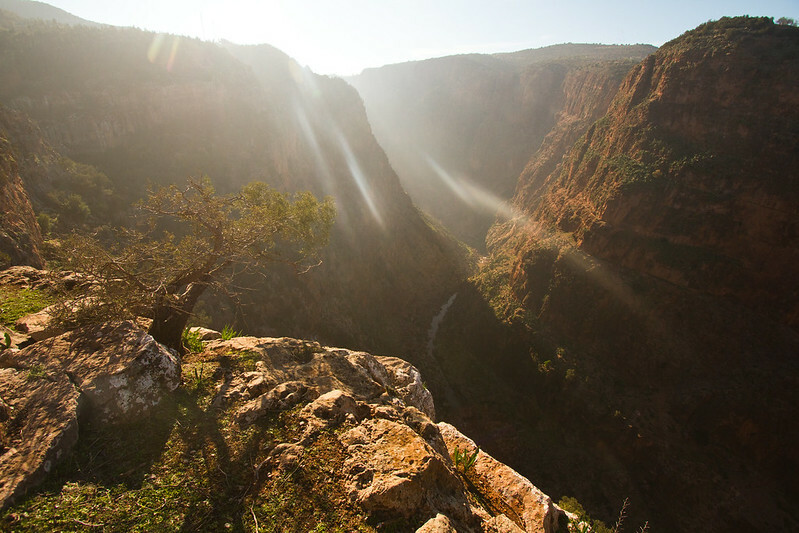 In one country, you can visit the desert, the mountains, lush oases, bustling cities, rolling meadows, forests, and deep gorges. Every day was stimulating and unique. 19. The food in Morocco is beyond delicious, affordable, and of supreme quality. Traditional mint tea, served in tiny glasses with far too much sugar, sticky, syrupy, pastries and baklava, made of almonds, pistachios, dates, eaten with Amlou, a thick paste of almonds, argan oil and honey. We ate fried aubergines, delicately spiced vegetable tagines, sauces rich with turmeric and cumin, steaming bowls of couscous, breakfasts of pancakes, with berry jams and loaves of bread picked up on the side of the road for next to nothing, but our favourite moroccan meal was at Earth Cafe, a vegan cafe hidden away in Marrakech’s souqs. 20. 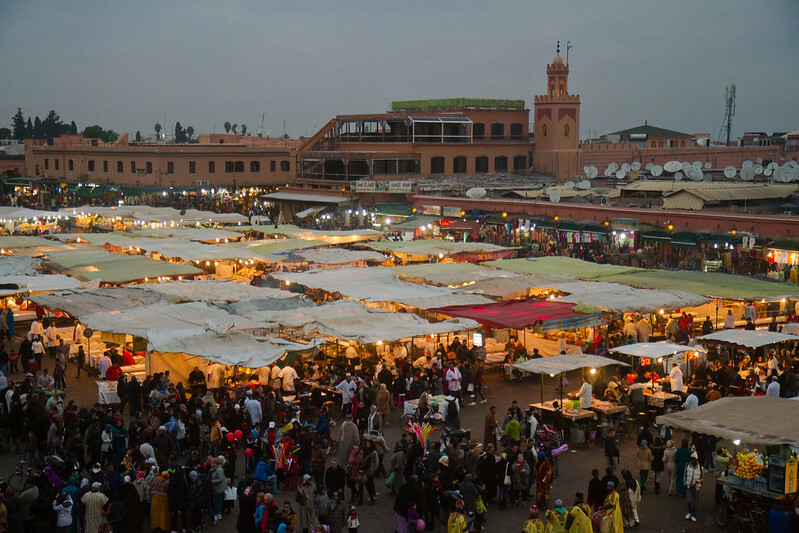 Jamaa el Fna, Marrakech’s main square and market-place, is an assault on the senses. Snake-charmers, drummers, men carrying monkeys, women armed with tubes of henna; the colours are vibrant, the sounds are overwhelming, and the atmosphere is hectic. Crowds of thousands of people pass through the square daily, it is a destination for foreginers and Moroccans alike. 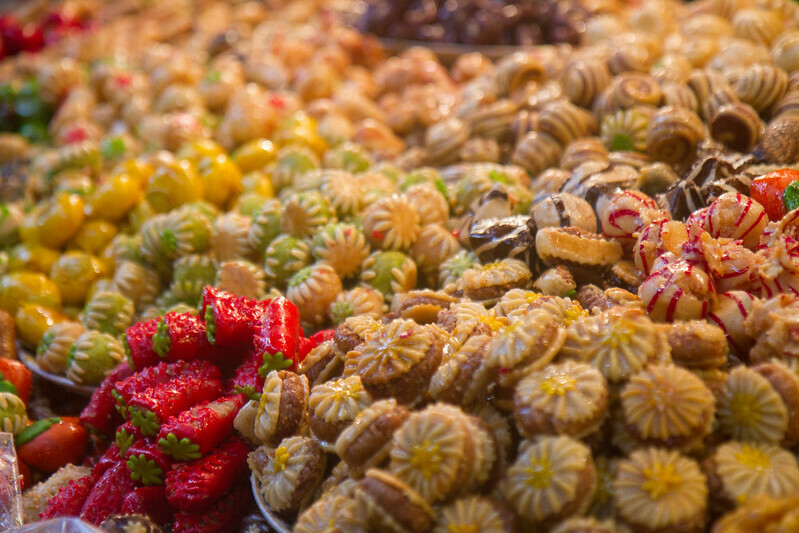 During the day, the square is predominantly occupied by orange juice stalls, and small stalls selling nuts and dried fruit. In the evening, however, the square truly comes alive, transforming as dozens of food-stalls appear and smoke and the smells of spices fills the air. The square is surrounded by a number of hotels and restaurants with balconies overlooking the craziness of the square below. 21. 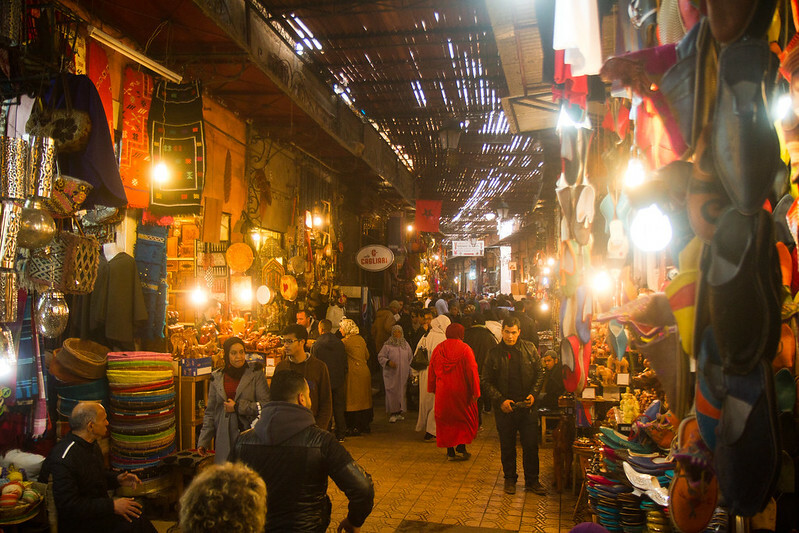 The hustle and bustle of Marrakech is a lot of fun, but for us it quickly became a little too much, we weren’t staying in a riad, and so we decided to make our way west, to the coast. We drove down to Sidi Ifni, a famous coastal town that in the winter hundreds of european RV’ers call home, however the town had recently been taken out by severe flooding. 22. 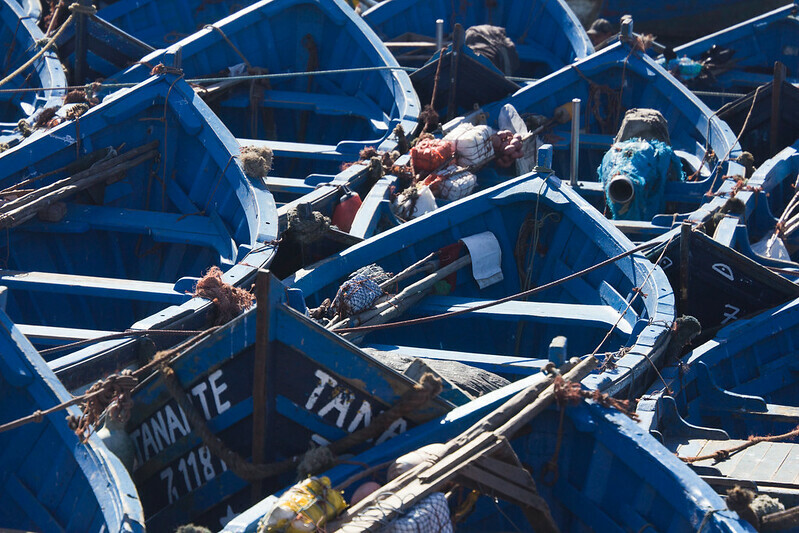 The Moroccan coast, particularly as you drive further south, is surprisingly under-developed. The little fishing villages, largely unchanged for years, and tiny surf-towns are a relaxing change of pace, and the beaches are stunning, too. Word is spreading about Morocco’s reputation for fantastic surf and affordability, though, so I’m not sure how much longer this will be the deal. 23. 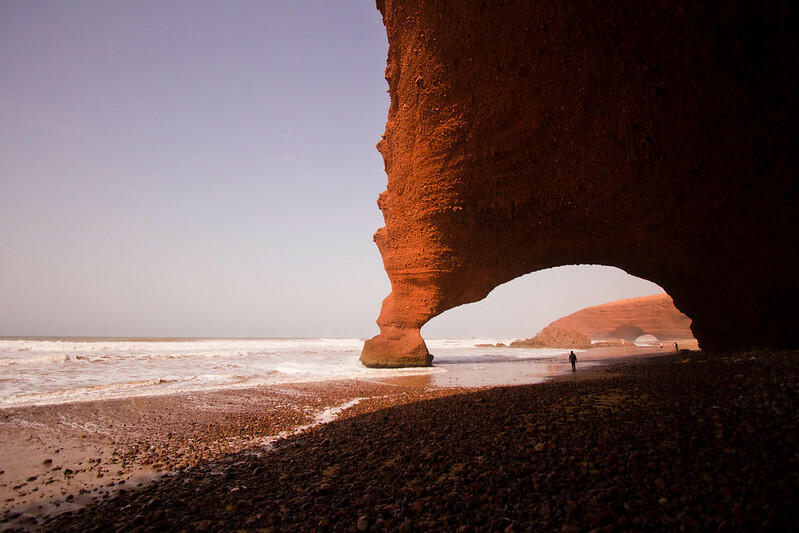 Driving north, through the towns of Legzira, and Taghazout, the road clinging to the coast, we’d stop once in a while to explore little beaches, rock formations, and fishing ports. 24. 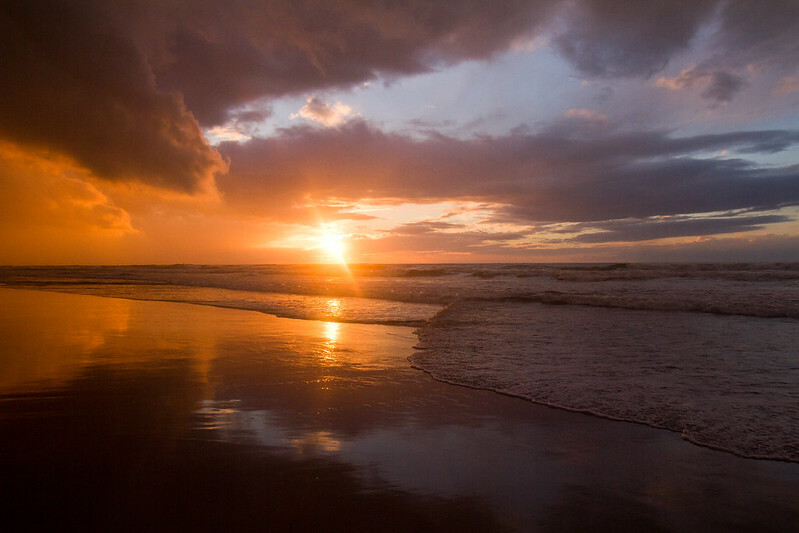 Incredible sunsets over the Atlantic Ocean. We spent one night camping, in our van, right on the beach! Morocco was wonderful for free-camping, better than a number of European countries we visited. 25. Our last destination was the Exotic Gardens, which we found on the old road from Salé to Kenitra. 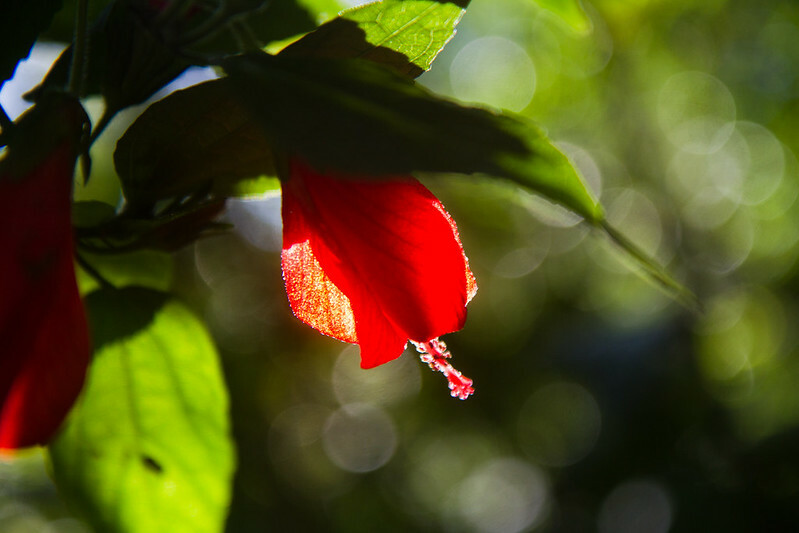 A cool and refreshing tropical garden, opened in 1951, the gardens are a beautifully laid out series of winding paths, rope bridges, rocks, ponds and little waterfalls. Awesome post, I’ll hopefully make it over to morocco with my van this winter. What did you do for water over there?